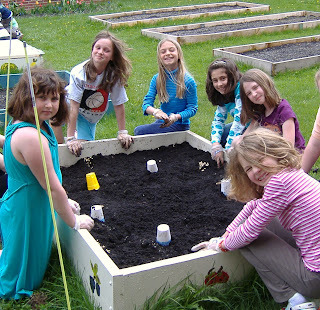 The Wentworth School in Scarborough, ME has shared their newsletter and some photos of their garden with us. We were able to help them out with some seeds through our giving program. Enjoy this fun update! Happy spring! The Wentworth School Garden has been taking shape with work inside and outside. The winter months were spent on lessons about the parts of plants and their functions, experiments with different seeds and research on the history of different vegetables and fruits. Amy Witt from the UME Extension Office did a presentation and introduced the students to many uncommon foods in our supermarkets. 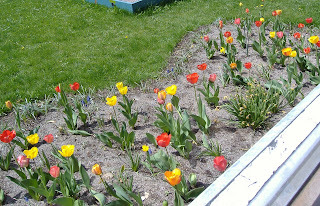 Spring was welcomed by the bulbs that were replanted by the work team in October. Tulips, daffodils, crocuses and grape hyacinths gave us needed inspiration through the rainy beginning of the season. 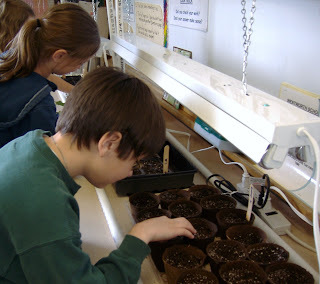 We wanted to start the garden seeds in the middle of April, but the kids wouldn't have seen the beginning growth over vacation. 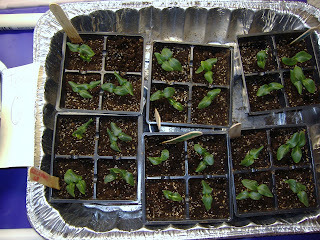 So we set up the lights and seed-starting stands (donated by Lowe's) in the classroom at the end of April. The students planted a variety of seeds, including zucchini, cucumbers, zinnia and sunflowers donated by Johnny's Selected Seeds. We have had fabulous results! The kids have learned to separate and choose the strongest seedlings for the garden. We have also planted lettuce, Swiss chard, beets, and radishes in two of our cold frames. Griffin Greenhouse Supply donated the polycarbonate for the covers, and Robbie Alden volunteered his time to construct them. We planted peas and added branch teepees as their supports. Now we are preparing the plants for the outdoors. We will be ready to plant outside next week! We are also hoping to plant potatoes in whiskey barrels. If you know of any that are reasonably priced or not being used, please email Joanne. We are now thinking ahead to the summer. The most exciting time in the garden will be during July, August and September. As requested in an earlier email and in Wolftracks, need your help in a variety of roles. We would like for families to volunteer to be in charge of the site for a week. So far, we have three families that have offered- thank you! If you are interested or would like to find out more information, email Joanne @ jmlstuart AT myfairpoint DOT net. We also are looking for volunteers to teach lessons from the Master Apprentice Gardener curriculum this fall and winter and help with fundraising. We're looking forward to hearing from you! Enjoy the photos! Please come and visit! It is very good that the children develop this way. But also I would like to recommend to develop children in terms of writing written paper works. And also in reading various reviews on books, films, pictures and other works of art that you can buy cheaply from click here which is an essay writing service. I also want to recommend to children to plant a variety of willows of flowers of trees and bushes, so that they enrich their knowledge of plant biology.